A developer has offered to build and pay for a new hospital in exchange for permission to construct 2,000 homes. Changes to emergency services at Kent and Canterbury (K&C) Hospital in Canterbury means some patients are now forced to go to Margate or Ashford. 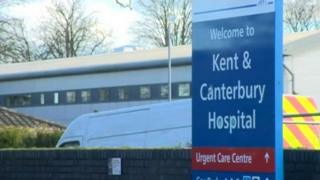 Health commissioners in Kent will consider the option for a new hospital in Canterbury to open as an A&E hub. Canterbury property developer Quinn Estates is behind the offer. Currently, the East Kent Hospital University NHS Foundation Trust's three main east hospitals - the K&C, William Harvey in Ashford and the Queen Elizabeth The Queen Mother (QEQM) in Margate - each provide different services. The CCGs want to reorganise and group services together. The plan does not include providing the equipment needed inside the new hospital. Concern for Health in East Kent (CHEK) has been campaigning for a new "hospital village" in the area for the last 20 years. Chairman Ken Rogers said a new hospital was "the only way to ensure the health needs of east Kent are met in the future". "It's recognised that we need new homes, it's up to the planners where they are put," he said. Mark Quinn, CEO of Quinn Estates, said: "Canterbury's housing shortage is chronic." It is one of two options put forward by Kent's clinical commissioning groups to be considered at a meeting on 30 November, ahead of a public consultation. The other would see QEQM and William Harvey reorganised into two emergency care centres, the latter with specialist services. K&C would be a 24-hour GP-led centre. It might only be an option but it is an idea that is likely to be met with joy and possibly anger in equal measure. Campaigners who have fought to keep services at the Kent and Canterbury hospital will be delighted the idea will get serious consideration. But for people in Thanet and Ashford, the future is less sure. Will they and their families have to travel to Canterbury for a whole range of specialist care including stroke, cardiac, vascular and trauma care? We don't know. And what of the arguments about allowing a private company to build the shell of an NHS hospital in return for planning permission to build thousands of homes? It's important to remember this is just an option and both NHS bosses and the public will have their say - but no-one can accuse health commissioners of not being bold.